The ultimate favorite, our Complete-Trim Filet Mignon is slowly and naturally aged before it's hand-carved and expertly trimmed of excess exterior fat. The result is a deeply marbled—yet lean—steak that melts in your mouth. 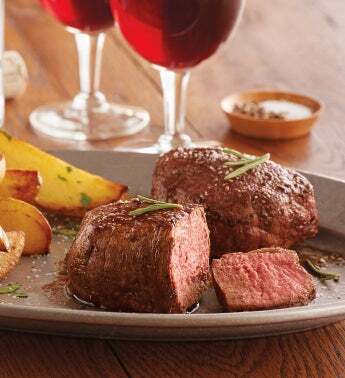 The filet's exceptional taste and tenderness makes it one of the most desirable steaks on the market. This USDA Choice-certified selection arrives with a bottle of Harry & David™ Reserve Pinot Noir.